In preparation for this weekend's Mad about Modernism program to be held at Rose Seidler House, SLM's gardens team called in extra support to step up the maintenance of the garden to ensure it will be presented at its best. 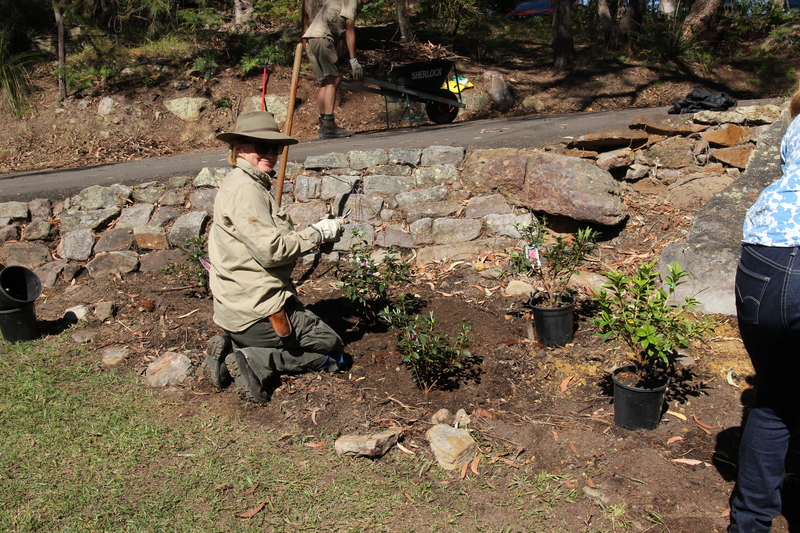 SLM staff and volunteers carried out an intensive half-day work session in the garden on a beautiful sunny winter morning to reveal the underlying rock ledges and walls and bring planted areas back to their former beauty. 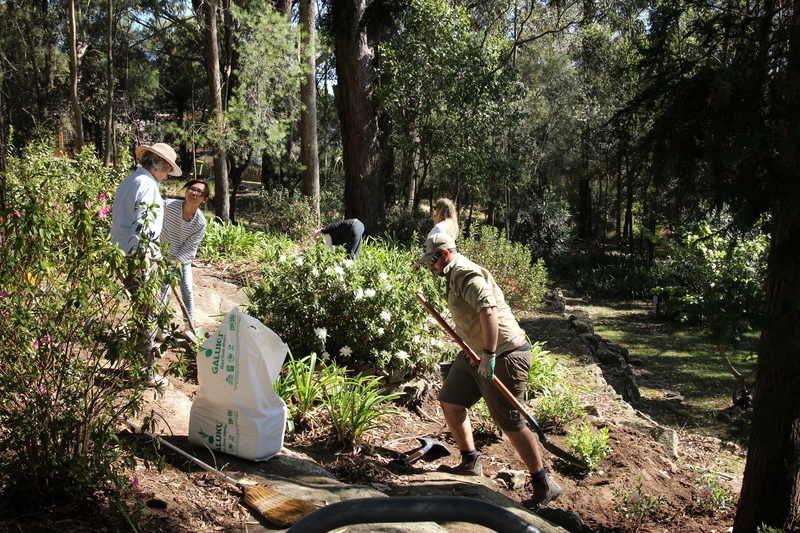 Their main chores were removing several tonnes of accumulated Eucalyptus leaf litter, bark and branches from planted areas; infill planting in the old azalea beds; weeding; watering and mulching. The extensive lawns were raked over to help remove thatch, improve aeration and stimulate new growth. The garden at Rose Seidler House isn't primarily given over to horticultural display as it was intended to be a green landscape setting for the three houses in the Seidler compound which all faced out to the spectacular gorge scenery beyond. Harry Seidler may have been familiar with similar properties he had visited in the USA before coming to Australia that modelled current landscape design ideas. The English landscape architect Christopher Tunnard, who taught at Harvard from about 1938 on, published designs for houses clustered along a private driveway in a woodland setting, each with views to distant natural scenery that has many similarities to the arrangement of the three Seidler houses at this property. These designs emphasised the aesthetic attractions of setting and scenery rather than ornamental horticulture. Rose Seidler became an enthusiastic home gardener, growing flowers, fruit, vegetables and ornamental flowering shrubs on the steep rocky slopes of her new home. As a result the property features fieldstone rubble walls, terraces and exposed sandstone shelves. Although originally cleared, a dense canopy of Eucalyptus and Turpentine trees has regrown over the years. The big bank of evergreen azaleas along the driveway is characteristic of north shore gardens of the 1950s and 1960s. Although capable of tolerating neglect, these will repay some care and attention by flowering profusely and making vigorous new growth. Old azaleas can be pruned hard to reinvigorate them, which we did here two years ago with excellent results. They should be at their flowering peak this weekend. The main challenges of the garden at Rose Seidler House are providing enough water and controlling the effect of Eucalyptus detritus. Eucalyptus leaves, bark and branches all contain oils and tannins which gradually break down and permeate into soil. The oil is water repellent and when there is a prolonged build up of litter the soil can become hydrophobic - that is, not able to be wetted. We use various wetting agents to help break down the oil and to enable water penetration into the soil, but the most effective method is to try to prevent the build up of leaves and thatch. This winter we also did some radical pruning of the old Citrus trees at the driveway entrance. Citrus can also be rejuvenated by skeleton pruning. We also fed, mulched and deep-watered these old stalwarts to try to stimulate some more vigorous new growth. Visit Rose Seidler House this summer and have a look at our progress. 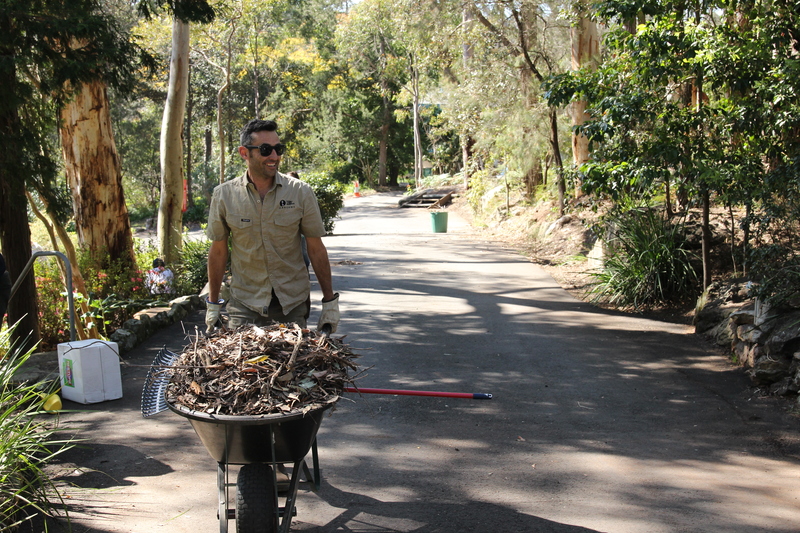 Horticulturist Leigh pushing one of the many loads of removed debris up the hill to be loaded into a trailer and used at Rouse Hill House and Farm. Ian Innes talks to the working bee team during lunch on the lawn about Harry Seidler and the house he built for his parents.